2007-2010: Moscow and Rome in their sights - LFChistory - Stats galore for Liverpool FC! It seemed to be the rule rather than the exception that Liverpool would get a tricky opponent in the Qualifying Round, a relatively unknown club that could dump you out of the competition before it had really started. Graz AK (2004), CSKA Sofia (2005). and Maccabi Haifa (2006) had all made life difficult for Liverpool teams aiming to get through to the lucrative group stage. Toulouse (2007) were not really expected to cause serious problems to Liverpool’s advance … and nor did they, Andriy Voronin scoring his first competitive goal for Liverpool in the away leg before the French club was comfortably defeated 4-0 at Anfield a fortnight later. There is always considerable interest and excitement when the draw for the group stage of the Champions’ League is made. Another French club in Marseille would be Liverpool’s first opponents with Besiktas and Porto making up the group. The home defeat to Marseille on Matchday one was possibly the team’s worst performance of the entire season. It’s always tough to progress in a group format if you lose your opening fixture. It didn’t get any better either. A 1-1 draw in Portugal seemed satisfactory but Jermaine Pennant’s petulance and indiscipline saw Liverpool down to 10 men with over half an hour to go. This was followed by a 2-1 defeat to Besiktas in Turkey, a result that saw Liverpool drop to the bottom of their group knowing that only victory in their remaining matches would be enough to ensure qualification for the knock-out stage of the tournament. Amazingly, that’s exactly what happened. Peter Crouch started and finished the scoring as Besiktas were torn apart 8-0 at Anfield, with a hat-trick from Yossi Benayoun and a brace from Ryan Babel inbetween as well as yet another European goal for captain Steven Gerrard; Porto were beaten almost as convincingly 4-1 with this time Fernando Torres scoring twice; and in the final ‘must win’ game in the south of France another Gerrard goal (a rebound after his own penalty had been saved) and a truly sensational solo goal from Torres saw Liverpool take an early two-goal lead. Gerrard’s goal meant that he became the club’s record scorer in European matches. Second-half strikes from Kuyt and Babel ensured that Liverpool comfortably qualified for the Last 16 knowing that they had a very real chance of making the final for the second successive season. The pairing with Inter-Milan gave the club an opportunity to eradicate one of the biggest injustices in the club’s history, namely the controversial European cup semi-final defeat to the Italians in 1965. Although Materazzi was sent off in the first half at Anfield, home pressure did not tell until the last 5 minutes when goals from Kuyt and Gerrard gave Liverpool a more than useful lead. In the San Siro three weeks later, Torres scored another fine goal to give the Reds an aggregate victory of three-nil as Jamie Carragher became Liverpool’s first European centurion. With three English clubs in the quarter-final, it wasn’t a major surprise when two of them were paired together … Liverpool and Arsenal. Three days before the first leg at The Emirates, the teams had drawn 1-1 in the Premier League at the same venue. That scoreline was repeated to give Liverpool a slender advantage for the return game. That advantage was wiped out by an early Arsenal goal from Diaby but Sami Hyypia’s towering header ensured parity before the interval. As Liverpool attacked the Kop end in the second period, the tie remained balanced on a knife-edge; and it stayed that way until 20 minutes from time when Fernando Torres’s control, turn and explosive shot saw the Anfield Reds take the lead on aggregate for the first time. Still it wasn’t enough though. An inspired run by Walcott led to an Arsenal equaliser 5 minutes from time but straight from the re-start Babel was fouled by Toure and Gerrard drilled the resulting penalty past Almunia’s right hand. Dutchman Babel ensured semi-final qualification with a breakaway goal in the final minute. Just as in 2005 and 2007, Liverpool and Chelsea would meet at the semi-final stage. But this time the crucial second leg would be in London not Liverpool. Dirk Kuyt, scorer of the deciding penalty in the shoot-out that took Liverpool to the final the previous season, looked to have given Liverpool a slender advantage to take to Stamford Bridge. But Fate would have the final say in this match. In the 6th minute of added-on time, John Arne Riise seemed undecided how to deal with an innocuous but nevertheless threatening cross from the left. Instead of hacking the ball clear with his foot, he ducked into the cross and it flew off his head past Reina for a most unfortunate own-goal. The Norwegian sadly admitted his responsibility but was chosen to start the second leg, in what would be the last of his 348 first-team appearances for Liverpool. Drogba and Torres scored to send the match into extra-time. 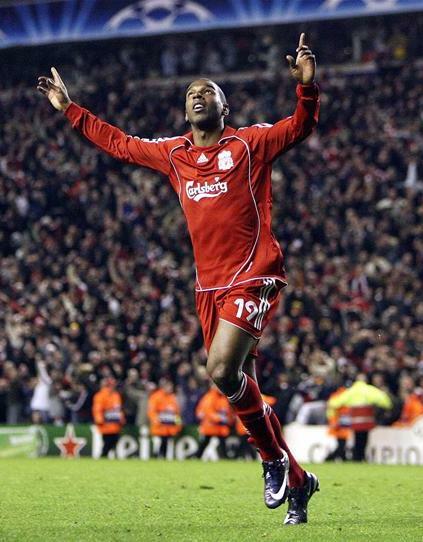 But when first Lampard and then Drogba seemed to have settled the tie in the Londoners’ favour, a long-distance strike from Babel briefly gave Liverpool hope. The referee’s final whistle ended that hope and so it was Chelsea that went on to meet Manchester United in the Moscow final. Another ‘awkward’ Qualifying draw saw Liverpool travel to Belgium to play Standard Liege in the middle of August, 2008. Reina saved an early penalty but even before that it looked as if the home team had taken the lead when Liverpool’s Spanish ‘keeper clawed back an attempt that seemed to be over the line. The visitors survived the storm but at Anfield a fortnight later it took until the 118th minute before Kuyt finally broke the deadlock from Babel’s cross. The draw for the Group Stage saw Liverpool quickly renewing their acquaintance with both PSV Eindhoven and Marseille but it was the pairing with Fernando Torres’ former club Atletico Madrid that attracted the most attention. An injury to Liverpool’s frontman meant he was unable to face his former team-mates at the Vicente Calderon but by then the Reds had already taken maximum points from their opening two matches. Gerrard unsurprisingly was heavily involved in both victories. A stunning shot then a penalty at the Velodrome were followed by an explosive free-kick against the Dutch at Anfield, this strike taking the club’s captain to a century of first-team goals. Two one-all draws with the club from the Spanish capital followed before both Marseille and PSV were beaten for a second time as Liverpool comfortably won the group. 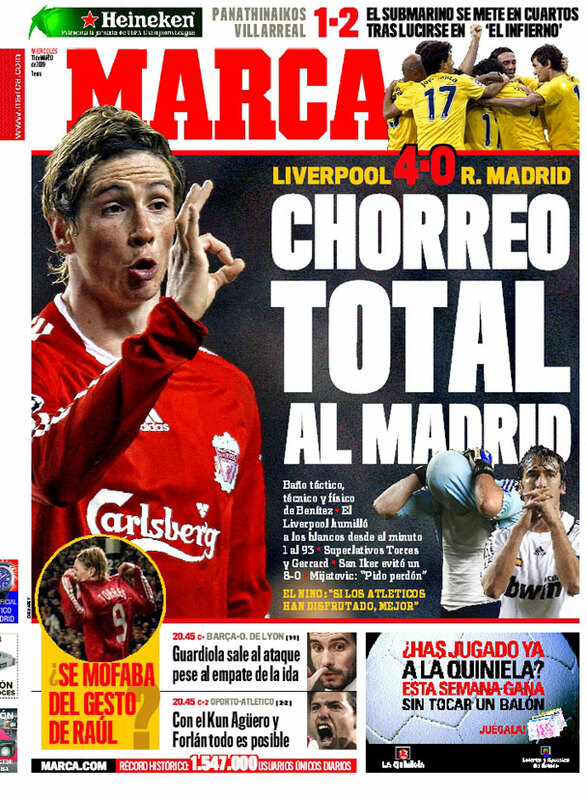 If the “Torres factor” of having to play Atletico Madrid was huge, it was equalled or surpassed by the “Benitez factor” of facing Real Madrid in the Last 16. Perhaps having already masterminded away victories in Barcelona and Inter-Milan (as well as Istanbul, of course! ), it shouldn’t have been too much of a surprise that Liverpool’s manager should oversee another famous victory on foreign soil. Benayoun’s late header gave the Reds a massive result at the Bernabeu but when Real came to Anfield they were swatted aside like an irritating fly. Casillas bravely kept the score down to four in what was one of Liverpool’s finest evenings of European football since its debut 45 years earlier. If the next stage draw threw up a surprise, it was that Liverpool and Chelsea would meet at the quarter-final stage not the semi-final stage. Just like a year earlier, the first leg would be staged at Anfield. Torres gave the Reds an early lead but the Londoners responded with three goals of their own. Liverpool’s task in London seemed to be impossible yet the team so nearly pulled off the greatest of Great Escapes. Needing to win by three goals without conceding one, Aurelio’s free-kick and Alonso’s penalty put Liverpool one goal from dreamland. Even when Chelsea equalised and then went ahead, the Liverpool team refused to lie down. Lucas, deputising for the injured Gerrard, saw a deflected shot fly past Cech in the 81st minute and just two minutes later Kuyt rose to power a header into the Chelsea net. An incredible roller-coaster ride ended with another Chelsea equaliser but the 14 men who represented the club in this epic encounter could hold their heads high at the phenomenal effort they put in. Sometimes there is no shame in defeat. This wasn’t a defeat on the night. It was an aggregate defeat that meant another European cup dream had been ended. But the manner in which Liverpool had fought, notwithstanding the defensive frailties that saw Chelsea come back into the tie in both legs, gave plenty of hope and optimism that further European adventures would not be long in arriving. Like all the other qualifying clubs, Liverpool and its supporters eagerly awaited the draw for the Group Stage of the 2009-2010 Champions League competition. After meeting a number of clubs more than once earlier in the decade, it was nice to be grouped with three clubs Liverpool had never met competitively before in Debrecen, Fiorentina and Lyon. But if anyone thought finishing this group in first or second place was a formality, they were in for a shock. A narrow but unconvincing victory over Debrecen brought three points but both Lyon and Fiorentina won 2-1 at Anfield courtesy of last-minute goals after Benayoun had given the home side the lead; Fiorentina also won at their own stadium and Lyon scored another late goal to force a draw after a thrilling drive from Ryan Babel had given Liverpool the lead in France. For the first time since the 2002-03 season, Liverpool dropped down from the Champions League into the renamed Europa League, the successor of the UEFA Cup. Although regarded very much as a consolation prize to the main event, Liverpool progressed to the semi-finals of the inaugural Europa League, with only the Round of 16 tie against Lille attracting an attendance of less than 40,000 for the home leg. Against Lille, Benfica and Atletico Madrid, Liverpool had the advantage of playing the second leg at their own stadium. But on all three occasions they had a narrow deficit to overcome from the first leg. 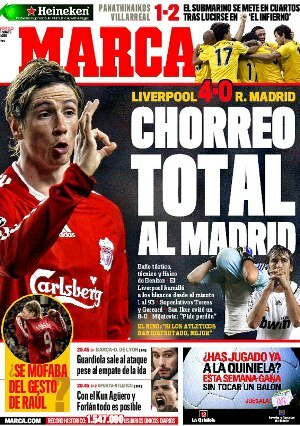 Lille and Benfica were swept aside, mainly thanks to two goals from Fernando Torres each time. The talismanic Spaniard, however, was unable because of injury to face his previous employers for the second season in a row. Without him, Liverpool laboured to a narrow defeat in Madrid. The team’s failure to score in Spain was costly. After overturning the deficit (Aquilani) and then going ahead early in extra-time (Benayoun), the nemesis that was Diego Forlan came back to haunt Liverpool again. With his strike disappeared the prospect of an all-English final with Fulham. The Champions League final will be held at Wembley in 2011, but for the first time in six years Liverpool won’t be competing in Europe’s premier competition and will have to make do with the Europa League in the 2010-2011 season.